Good news for the candidates who are hunting for the IT Companies Syllabus & Test Pattern. Get the required stuff on this page for the upcoming MNC Exams. All the MNC and other IT companies will conduct the aptitude test as per their rules. This test is to check the knowledge of the aspirants. Everyone who had applied for the IT Job openings can check and download the MNC Online Exam Syllabus from this page. As we all know that the syllabus plays an important role in the exam preparation. If any candidate is not aware of the Aptitude Test syllabus cant perform well in the examination. Before starting the preparation all the contenders who had recently applied for the IT Job Openings 2018 can refer this page to get the company wise IT Companies Syllabus & Test Pattern. Now all the MNC companies are hiring the candidates based on their performance in the Aptitude Test and other rounds. 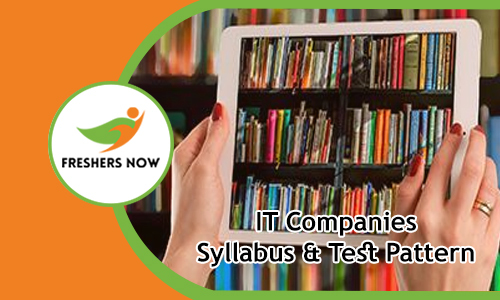 Nowadays most of the aspirants are craving for the IT Companies Syllabus on the various websites. No one is providing the company wise Syllabus & Test Pattern. To guide the aspirants in their preparation we are providing the each and every IT company syllabus & test pattern on this page. So the applicants who are worrying about the syllabus can stop worrying and refer this page. Candidates can find full of information about the MNC Online Test Syllabus in a detailed manner. On our web portal, we are providing the syllabus by subject wise. Candidates who had not started their preparation for the MNC Aptitude Test can begin now. Each and every minute topics and sub-topics of every subject is furnished on our website. Therefore the candidates who are preparing for the written test can get a minimum idea of the IT Companies Syllabus & Test Pattern. By knowing the topics of the syllabus the candidates can concentrate more on the preparation to get a good score. Along with the MNC Exam syllabus, we are providing the IT Companies Test Pattern which will be helpful. Test Pattern will give a clear idea about the sectional wise topics, weight age of marks for each section, time limit, the total number of questions and marks in the paper. This information will help the aspirants to know the plan their preparation time in an effective manner. Generally, for every MNC Online Exam, the questions will be from Quantitative Aptitude, Logical Reasoning, Verbal Ability and some other. So for the sake of the candidates, we are providing the IT Companies Syllabus by company wise. Please check it before starting your preparation. On this page, we are providing all MNC companies HCL, TCS, Google, Yahoo, AMDOCS, Accenture, Wipro, Cognizant, iGate, Infosys, Microsoft, Tech Mahindra, Oracle, HP, SONY, L&T, Mindtree and more Companies. We have tabulated the every MNC Company Online Exam Syllabus 2018 in the above section. So our suggestion to the aspirants is not to waste your time in searching and get the complete syllabus & test pattern from this page. By preparing according to the MNC Aptitude Test Syllabus 2018 the aspirants can cover all the topics without missing. Candidates who follow the syllabus can easily plan their preparation time. With the help of the Syllabus, the aspirants can make a plan by allocating some particular time for every topic by chapter wise. Aspirants have to pay attention While preparing for the written test. As there is high competition for the jobs in these days. So pre-planned preparation along with the good source is most important. At the beginning of the preparation, the aspirants have to check this page thoroughly for the MNC Companies Syllabus & Test Pattern. Year by year there is high competition for the IT Jobs. This can be achieved only by the proper preparation. So aspirants have to make a perfect plan and preparation to get through the exams. We hope the current information about the IT Companies Syllabus & Exam Pattern is quite enough for the candidates who are sincerely preparing for the written test. Be in touch with our website Freshers Now for the latest IT companies syllabus. From time to time we will update this page. So candidates can get instant updates about the MNC Online Exam Syllabus.